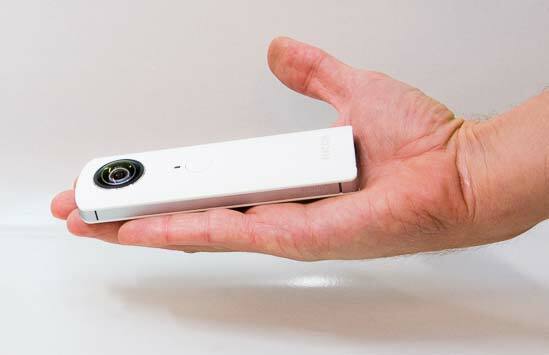 The Ricoh Theta is the world’s first mass-produced imaging device that can take a fully spherical photo with one shot. 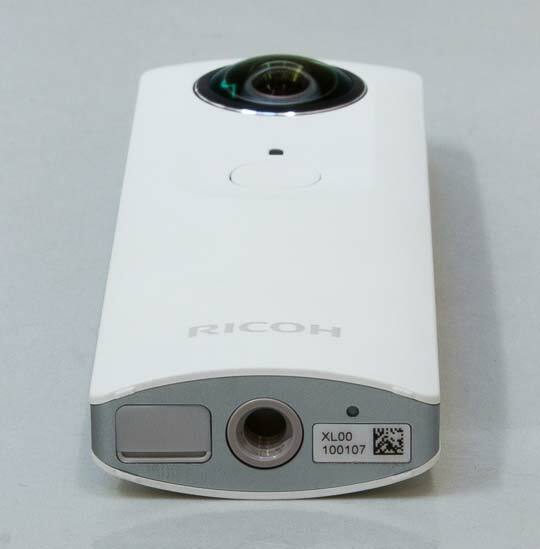 The hand-held Ricoh Theta features a twin-lens folded optical system that captures the scene around, above and below for fully spherical images. It can also be mounted on a tripod and controlled remotely via a smartphone. Images can be immediately transmitted via Wi-Fi and viewed with a dedicated free app. Images uploaded to theta360.com can also be shared on social networks. The Ricoh Theta costs £329 / $399. 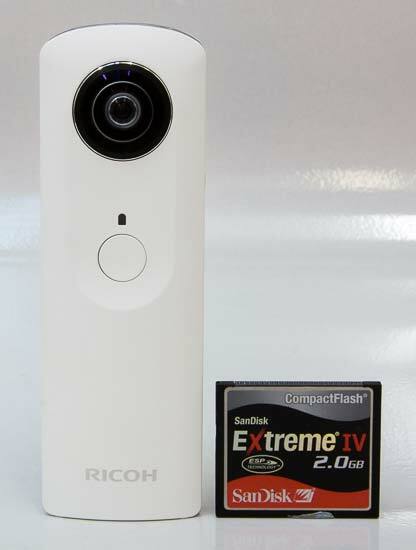 The Ricoh Theta is a very light (95g), well-made pen-shaped device with two fish-eye lenses on both sides which enable it to capture a 360-degree view in one shot. There are just five controls - the shutter button on the front, power on/off and wi-fi buttons on the side, and a tripod socket and USB port on the bottom. It doesn't take memory cards, but does have 4Gb of built-in storage. Taking a photo with the Ricoh Theta is simplicity itself - simply hold the camera up and press the big round shutter button on the front. The device automatically takes a stitched-together 360-degree picture, which will include you if you're holding the camera up for the ultimate selfie, and less obtrusively the tripod mount if it's mounted for remote shooting via the iOS app. We found it best to mount the Ricoh Theta on a tripod and use an iPhone to fire it remotely whenever possible. That way, you can make sure that you're not in the picture at all, if there's something to hide behind! The Theta connects to an iPhone via wi-fi, rather than Bluetooth, which is a little annoying as you have to disconnect from your home wi-fi first before connecting to the Theta. As the Theta doesn't have an LCD screen, we expected to be able to preview images via the app, but surprisingly that's not possible. While you could argue that you know that you're going to capture everything around you anyway, it would be nice to be able to check just how the Theta is orientated. The iOS app additionally allows you to alter the brightness of the image using an onscreen slider, something that you can't do directly on the Theta itself. That's the sum total of the Theta's photographic settings - you can't change the white balance, ISO speed, aperture, or any other common setting. The app also allows you to see and interact with pictures from the Theta, both ones that are currently stored on either the device or the smartphone. The Theta does a very good job of stitching the images together - you only tend to notice the joins when viewing the "flat" image at 100% magnification, rather than the 360-degree spherical version. Image quality is more like a smartphone than a traditional camera, with images being sized at 3584x1792 pixels, but it's more than good enough to allow you to pan round and zoom into the image. The aperture is locked at f/2.1 and the ISO speed varies from 100 to a much rarer 800 setting in very low light. 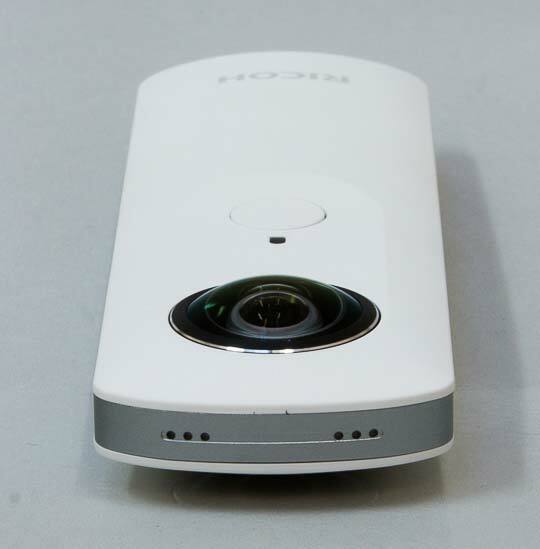 Once you've taken a picture with the Ricoh Theta, it can be viewed in a number of ways. Transferring images directly from the device to a PC or Mac and then opening them via the OS's file browser previews a "flat"version, as shown in the Sample Images section below. To be able to fully interact with the image, you either need to view it on a smartphone, or upload it to the dedicated Theta website (theta360.com), where it's stored on a per user basis - here's my account - or download the Windows / MAC desktop viewer. We successfully used the iOS app, Windows desktop app and Theta website to explore our 360-degree images. Finally, sharing your Theta images with friends and family is a little trickier than viewing them, and a little trickier than we'd like. You can instantly share them on Facebook, Twitter and Tumblr, although strangely Facebook wasn't an option in the iOS app that we tried, only the Windows desktop client, and the Theta website only posts to Facebook, not Twitter or Tumblr! Unfortunately, you can't interact with the Theta picture directly within the timeline, as only a static thumbnail image and link are posted. Similarly, if you want to post on other networks, notify via email or embed in a webpage, the only method is to share the actual URL of your image from where it's hosted on the Theta website, then allowing people to click through and view it, which isn't very intuitive or convenient.